World 8- Bowser's Castle: Part 1 is the final level of the first part of World 8 in Super Mario 3D Land. This level uses a different version of the usual castle theme as the background music. This level requires 90 Star Medals to unlock. At the beginning, Mario is on a platform surrounded by lava. On the other end is a P Switch, guarded by a pair of Magikoopas. 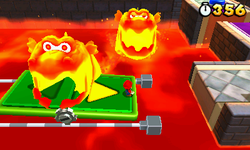 Pressing the button causes a grate platform to rise out of the lava, allowing Mario to advance. On the next platform is a pair of Dry Bones. Following this is another grate platform, with a Coin Question Block on it; however, there is also a Magmaargh that appears out of the lava to attack Mario, as well as a Bubble in the lava on the other side. On the next platform, there is a Draglet, with the next platform being across the lava; there are also two Lava Bubbles jumping out of it. Next, there is a pole; the player must use this to jump onto another pole to reach the next platform, but there are two lava geysers on both side of it. The next platform has a Fire Bar and another Magikoopa. He or she must then jump onto a Switchboard to cross the lava and reach the next area, while avoiding several Magmaarghs. On the next area is the Checkpoint Flag, as well as another P Switch which not only spawns some coins but also causes the section of the platform it is on to rise. The area this leads to contains three Boomerang Bros. After the player passes them, he or she reaches an area with platforms that spawn when the player nears them; there are also some Magikoopas that appear. This leads to a Warp Box, which takes the player to the area where he or she must face Bowser. After crossing several rotating platforms, he or she must then cross a section with a tightrope above lava. The player must then cross several rock Donut Lifts to reach the bridge that the switch necessary to defeat Bowser is across. By pressing the switch, Bowser falls into the lava, where he is defeated. However, inside the room following, there is only an empty cage. Upon entering the door at the end of the room, a cutscene is shown; Mario finds what he believes is the princess, but, upon further examination, he finds out that it is really a cardboard cutout. Bowser then shows up, holding the real Princess Peach. Mario attempts to get her back, but Bowser leaps away and heads off; if the player replays this level, this cutscene is not shown a second time. A Warp Block is then present, which takes the player to the tower with the Flagpole. Star Medal 1: After passing a Draglet, the player will come across a pair of poles. The player needs to hop off the first pole, while avoiding the rising magma pillars, to second pole to reach the medal. Star Medal 2: After the checkpoint, the player will face some Boomerang Bros. Defeating all three will grant the player with a Boomerang Flower, which is needed to grab the medal nearby. It can also be obtained by clasping the wall and wall-jumping when near the lava to grab the medal. Star Medal 3: During the fight with Bowser, it can be seen floating over the lava and between two platforms. Mario needs the Boomerang Flower to reach it. ↑ von Esmarch, Nick. Super Mario 3D Land PRIMA Official Game Guide, page 111.